In "The FlipSide", local blogger Belmont Lay lets loose on local politics, culture and society. To be taken with a pinch of salt and parental permission is advised. In this post, he talks about the dangers of passing off fake news as real. In the strangest twist to this by-election season yet, Singapore Press Holdings-owned online portal STOMP briefly presented a fake news piece as the real deal. The context? 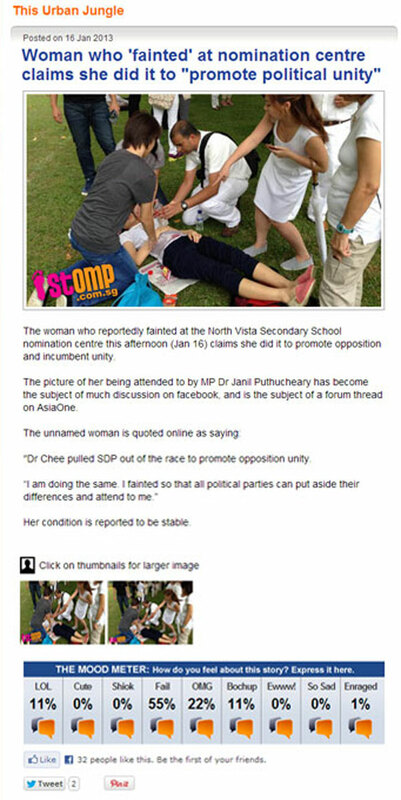 A popular photo making the rounds on Facebook showing a woman who had fainted at the North Vista Secondary School nomination centre on 16 Jan this year was dressed up to become a parody piece by New Nation, Singapore's version of The Onion, a U.S. website featuring satirical articles on international, national and local news. To be fair, The Onion has duped many people, including a Chinese paper and an Iranian news agency, with its fake news articles. In the case of New Nation, of which yours truly is an editor, its piece titled "Woman faints to unite Singapore" was written in the spirit of poking fun at the Singapore Democratic Party for claiming that their withdrawal from the Punggol East SMC by-election was guided by the principle of promoting opposition unity. Seems the STOMP administrators failed to read between the lines there. Also, unlike the naive Chinese paper that had the grace to credit The Onion, the Singapore report was not attributed back to its source. Still, people online caught them out with their pants down and the jibes against the portal came hard and fast. Online comments can be unforgiving. I can sense that these guys were holding back already. The fake news item stayed on STOMP for up to two hours. When it was eventually taken down, it went away quietly without even informing readers that a severe error in judgment had occurred. This blunder comes in the wake of a controversy last June, when one of STOMP's staff put up a fake photo about an MRT train door opening, which sparked an investigation by the transport operator to assure the public everything was in order. The staff who faked the piece earned a public rebuke and was subsequently fired. Protocols were supposedly put in place by STOMP to prevent any such future errors. Wonder what happened to that. Belmont Lay is the editor of New Nation. He is very happy he got to troll STOMP. At least once.